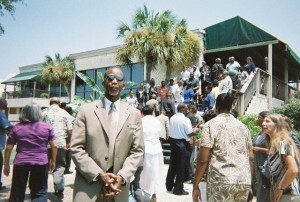 How serious are civic leaders in Selma, AL about a complete and accurate count in the 2010 United States Census? Serious enough to get state approval to close down the historic Edmund Pettus Bridge. The span, infamous for the vicious March 7, 1965 “Bloody Sunday” attack by state troopers on civil-rights marchers, only temporarily was indisposed at 7 a.m. this morning, a Saturday. Police had alerted citizens to adjust their schedules or use a bypass route. But the move was the latest step by the Alabama community’s Complete Count Committee to help national and state officials recognize where some of the $300 billion in federal money to be allocated annually for the next 10 years should be invested. Thus a diverse group of elected officials, business people, educators and religious leaders are saying to their fellow Dallas County residents: We need you to support the 2010 Census by sending back the 10-question form due to arrive in the mail April 1. I was there as part of a group of African-American leaders and others who are connected to and active in their communities, and also advocates who can help get the word out about the benefits, dispel myths and communicate the criticisms we hear. I plan to share more regarding the meeting as well as the ongoing census effort. So the committee has elected and school officials on board, she said. A former unused school campus building is now the U.S. Census Workstation, for anything from answering questions to Census job testing. Census job announcements are posted in schools and offices. Flyers were passed out at school graduations encouraging people to please send back their Census forms. Perhaps other communities and their Complete Count Committees not need be as proactive. Then again, given the economy and the desperate need across America, maybe they should. 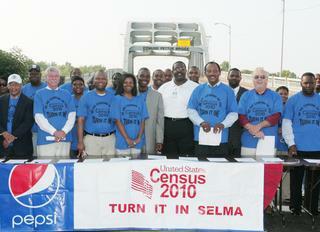 How serious are civic leaders in Selma, AL about a complete and accurate count in the 2010 United States Census? Serious enough to get state approval to close the historic Edmund Pettus Bridge. The span, infamous for the vicious March 7, 1965 “Bloody Sunday” attack by state troopers on peaceful civil-rights demonstrators, only temporarily was indisposed at around 7 a.m. this morning, a Saturday. Police had alerted citizens to adjust their schedules or use a bypass route. 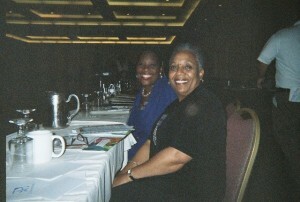 Joyce Russell (front), Hillsborough County, FL, government liason, and L. Yvonne Whitehead, program coordinator for the Tallahassee Urban League. I was there as part of a group of African-American leaders and others who are active in their communities, and also census advocates who can help get the word out about the benefits, dispel myths and communicate the criticisms we hear. So the committee has gotten elected and school officials on board, she said. A former unused school campus building is now the U.S. Census Workstation, for anything from answering questions to Census job testing. Census job announcements are posted in schools and offices. Flyers were passed out at school graduations encouraging people to please send back their Census forms. Thank you, Thank you let’s get everyone Counted.